The final sermon for Good Friday, preached at the Liturgy, was from Mother Anne-Marie. Good to see so many more people there this year! This is our God, the Servant King. If you have been with us during the two hours preceding this service you will have been listening to reflections on this hymn written by the contemporary hymn writer, Graham Kendrick. This is our God, the Servant King. And here he hangs – The Servant King, our God. On Palm Sunday he almost looked like a King – he rode into Jerusalem and the crowds cheered, but riding on a donkey was not quite what you expect of a King. Last night, Maundy Thursday, he showed us what it means to be a servant. He washed his disciples’ feet to the protests of Peter who couldn’t bear to see his teacher and his Lord, get on his knees and wash the dust from his feet. Like riding on a donkey it is not what you expect of a King. Now today, Friday, He hangs on a cross. The man they thought of as Messiah, a Saviour, a King, has now been executed and hangs on a cross. Well many Kings have been killed in battle, in civil war or palace coups. Sometimes they have met their death through an execution. So perhaps the most kingly thing about Jesus is being executed in a power battle. It has happened to many a king in history. But this man who hangs on the cross is not just a King. He is our God. This is our God, the Servant King. His divinity will not be explicit until Sunday when he rises from the dead. That is when this painful death, this sacrifice may make some sense. But today our eyes are not on Sunday for we need for a while to focus our vision on the cross. We do need for a while to dwell on what Jesus went through, to see his hands and his feet, the scars on his body that speak of sacrifice. We may ask “why did this have to be?” We may be angry that God allowed such suffering and this was his Son, nailed to the cross. We may be puzzled by words of hymns that come floating back from childhood……..” and we believe it was for us he hung and suffered there.” Do we believe that? If we do how do we feel about it? Was it my sin that put him there? Did he really choose to bear my heavy load on the cross? Why did this once and for all sacrifice take away not just my sin but the sin of the whole world? On the cross hangs the weakness of God, stronger than all our strength. This is our God, Christ the servant King. We proclaim that this Christ crucified has the power to save. It is indeed God’s foolishness. So foolish it is amazing. This is our God, Christ crucified. Obedient to death, even death on a cross; this is our God, the Servant King. And now he calls us to follow him, to bring our lives as an offering at the foot of the cross, to rededicate ourselves to lives of worship and service – to be servants of the Servant King. He calls us now to follow him. God loved the world so much that he gave his only Son. 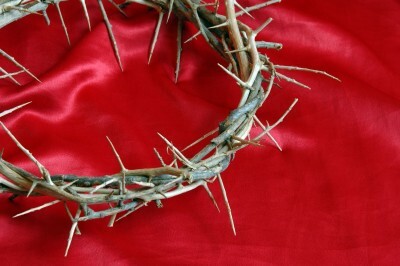 This Son, the Servant King, God’s love personified, hangs on the cross. It is foolish, but this self giving love is also so amazing and so divine that it demands my soul, my life, my all.